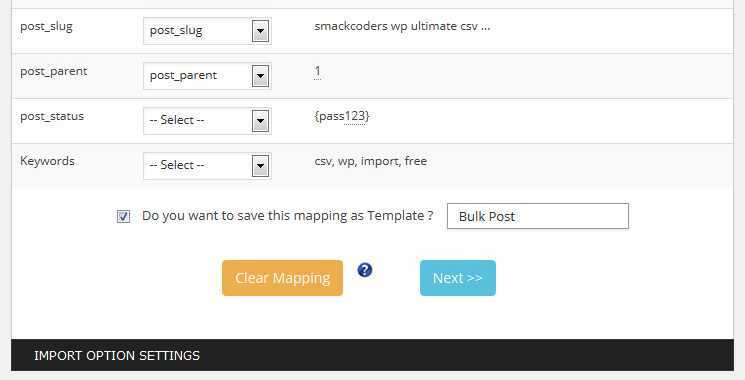 Advanced Ultimate CSV Importer plugin version 3.5.3 with some fixes and custom post type export will be released and available in couple of days our store. The free upgrades will be available to our existing customers on request by mail to our sales or support. Check again for more news and read more about next version 3.6 changes. * Allowed for demo use only. * Datas are restored back periodically. In Version 3.5 users need to configure the settings tab first. To add flexibility and for much more simple user experience users can enable frequently used modules like posts, custom posts etc. Leaving other modules disabled and enable other available modules only when needed. This will give much room and easy to access for most used tabs. 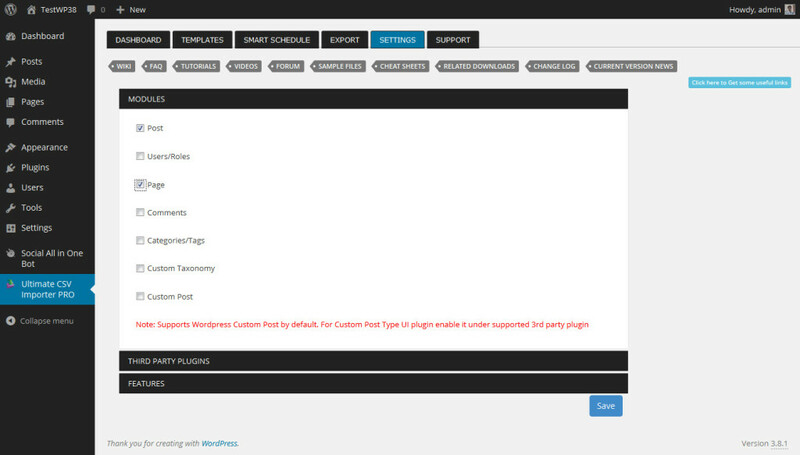 Note that for custom post types you should enable related plugin from 3rd party supported plugin in settings. Under Supported 3rd Party plugins users can enable import support for available plugins. Note that enabled plugins should be already installed and activated to make it work as expected before import. For extended features like Auto UTF-8 handling and auto mapping, enable it under Features accordion. 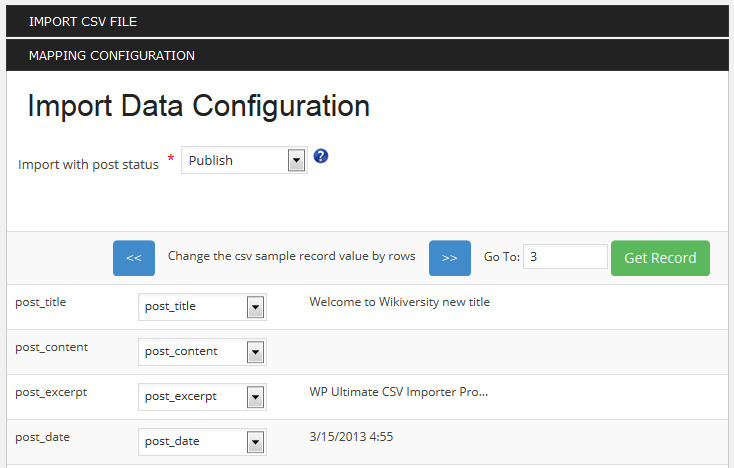 Simple 3 steps import process with step by step options make it easy to understand ultimate csv import plugin features. Step 2 – Map your uploaded CSV headers/column name to relevant wordpress post field attributes and custom field etc. In new 3.5 version user can drag and drop csv files to upload in addition to traditional file browse feature (Free feature). Select the delimiters , or ; as separator used in your csv (Free feature). You can assign an already saved mapping template from the drop down for field mapping (Pro feature). Also can schedule the import process in future time and date which will be handled by smart scheduler (Pro feature). In advanced mapping feature users can now verify their mapping by added data sampling feature in top by rotating the sample values using next, previous buttons or go to nth row option. In the footer of mapping step (2) users can save filed mappings as a Re-Usable template now for both scheduled and manual import processes. In addition to Duplicate Handling options users can add Server Requests depends on their server load and performance. So no more timeout issues. The value should be minimum 1 and max is no rows in your uploaded csv file. Recommended value is between 3-5 to view real time log depends on no of attributes need to assigned to each imported post. 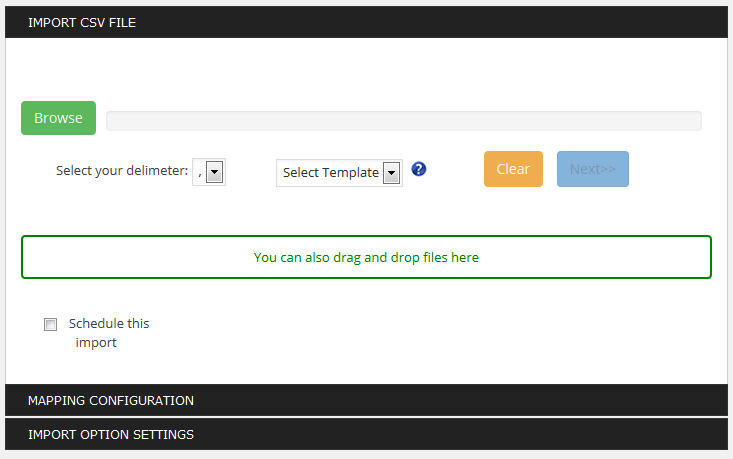 A simple template manager to manage saved mapping templates as to edit and delete etc. Smart scheduler is to manage, monitor all scheduled import job and their process status etc. Users can edit or delete a scheduled job. Export feature is in separate tab in which users can select a post type to export completely as csv to your hard drive. More features like filtered export and other modules export like custom post etc are in pipeline. Lot more future changes are planned for this section. Check back again for updates. 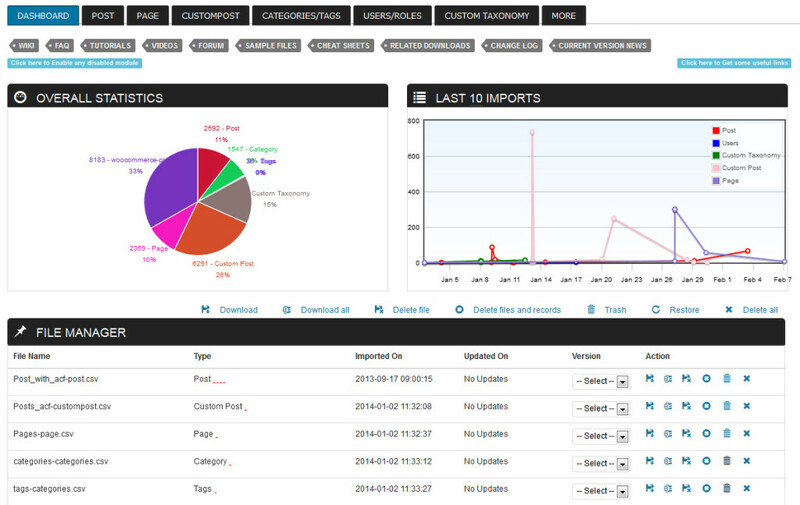 Finally now Dashboard with file manager have a new look interface. To add simplicity to get help and support the plugin header have all useful links to wiki, faq, support, videos, tutorials, sample and cheat sheets links. Added to this users can use easy support form for feature request and feedback. In footer users can have one click access to other useful free and pro plugin links. Kindly verify our other plugins that may be useful now in future.